I have another makeup review for you! This one is courtesy of a network called Octoly. I received two Clarins products from them- the 4-Colour All-In-One Pen and Supra-Volume Mascara. I will post a short review on Instagram, but I like showing off products in a blog format to really be thorough. This post is looong overdue I am ashamed to say. I would try to explain my lame reasons but you know the saying, "Excuses are tools of incompetence". And sometimes I feel so incompetent! *Sob* Well I hoped I've made up for it by making some manis to inspired you! Powder Perfect has made three beautiful stamping plates and I've done a couple different looks with each plate. I used five of their stamping polishes (Black, White, Gold, Silver, and Orange) for all of them and I love how well they stamp. I've also reviewed a top coat and two base coats at the end of the post. Hello my lovely Society Sisters! Raise your hand if you were part of the April the Giraffe giving birth craze. If you don't know what I'm talking about.. don't worry about it. I wasn't personally riding that train, but I'm all on board for cute giraffe nail art! Last month when I was participating in The Essies I was sent the Spring 2017 collection to use for my nail art tutorial. 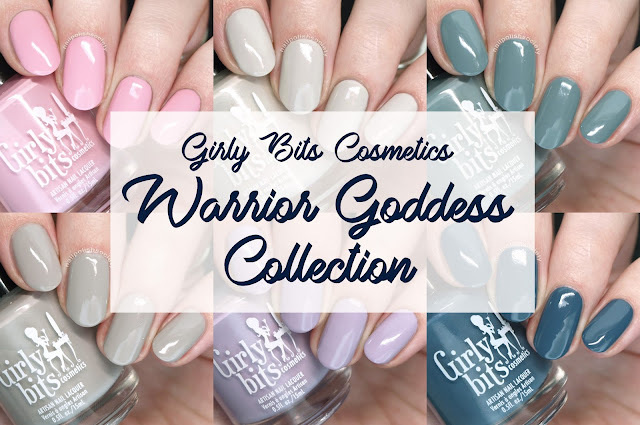 The saturated colors of the collection make me happy so I am sharing swatches with you today! I have this month's Ipsy Glam Bag to share with you! It's crazy how different they all are depending on your preferences, etc. I haven't seen anyone else with one exactly like mine (I haven't really looked that hard), so I wanted to show you the products I received. You can check out the look I did with last month's Glam Bag here. Hello lovelies! Girly Bits released their Warrior Goddess Collection, a set of six wonderfully dusty cremes, a couple months back and I fell for them. I resisted well for a few weeks, then finally caved and bought them all! I love me a good creme polish and these formulas and colors were too good to pass up. (I've already used two of the shades in some nail art here). 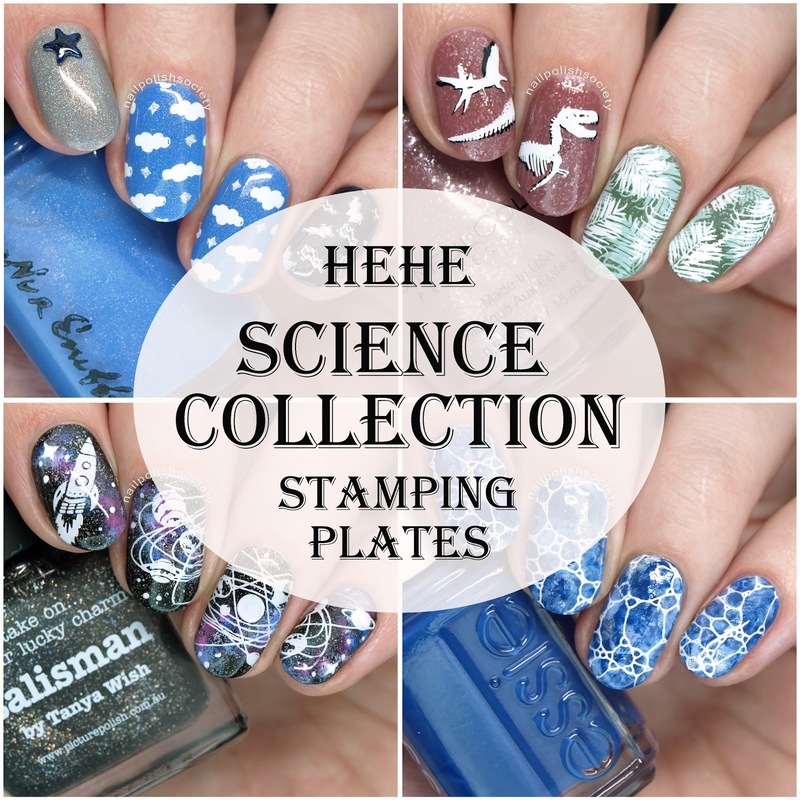 Let's take a closer look..
A couple weeks back I reviewed some new plus size Hehe stamping plates and as promised I am back with their Science Collection! When I saw this collection released last year I fell in love. There are so many awesome and unique images! I'm not a science nerd by any means. My hubby is the one with the Scientific American subscription, although I might pick it up to look at the pictures, lol. My point is, anyone can appreciate this collection because it is just so COOL. Yes! It's that time once again.. We are entering neon season and I am so ready! Indie brand Turtle Tootsie Polishes has created a bright summery collection consisting of six holographic neons, one glitter crelly, and one holographic glitter topper. The Jailbird Collection theme and individual polish names are just as playful as the colors. It reminds me of these Valentine's Day printables I created a couple years back that are on a similar vein. The neon formula was slightly thick but self leveled well. As is typical of neons they all dry down to a dull finish, so I've applied a glossy top coat to each one. Hello and happy Monday! I hope you all had a wonderful Easter weekend. 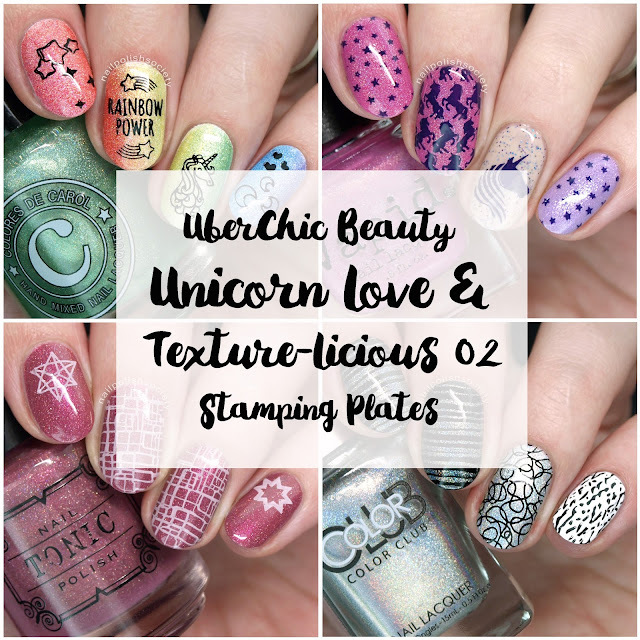 Last week UberChic Beauty had a huge launch of new products and I couldn't wait to dive into them. I didn't want to fit them all into one post so I started off with two of my favorites. I think you'll really like them too! Get out your bibs, 'cause you're going to be drooling by the end of this post. Sunny's Body Products has created a delectable twelve piece food scented sampler box ranging from coffee to candy to fresh baked bread. Some of these are so delicious you'll be tempted to taste them, I'm totally serious. Best part is, they are all calorie free! Are you ready to see the gorgeousness that is this new Colores de Carol release? I cannot tell you how in love I am! The shades are stunning and the formulas are great. In case you think I'm exaggerating we'll move right along to the photos. Hey loves! Today's post is swatches of indie brand Polish My Life's Naughty Nauticals collection. I bought this whole collection because the color palette is so beautiful together and perfect for Summer. The six piece collection is made up of creme/jelly formulas that all apply smoothly and build up to a glossy and squishy finish. Also, they watermarble like a charm as you may have seen me showcase here and here, and will again at the end of the post. On top of it all I helped name (you know how much I love to!) two of the polishes from sneak peeks in the fan facebook group. Hello there! I hope you all had a great weekend! Mine involved lots of sunshine, rain, and snow. The weather here is never boring, haha. 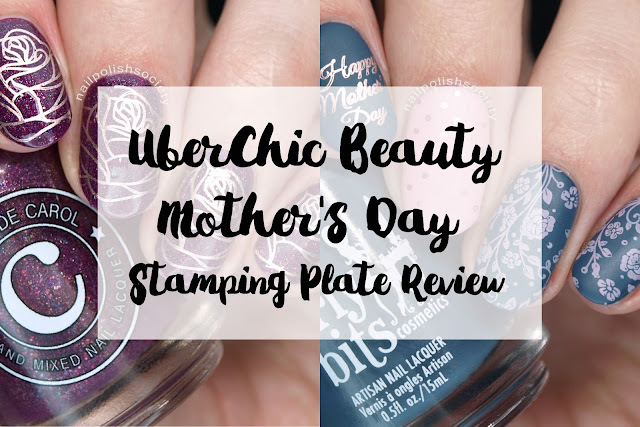 I'm going to start your week off right with another UberChic Beauty review. Let's get right to it. Hello lovelies! Today's post is nail art (yay!) created with a few products I was sent to review from What's Up Nails. They have recently launched under their house brand name, six awesome new stamping plates. The designs on the plates are really beautiful and the etching is high quality. I was sent another product not shown above that has presented a learning curve for me so I'll have to have a second post for when I figure it out! Heya! I got the opportunity to try out the Sally Hansen Miracle Gel line recently. I've been a long time Sally Hansen fan but hadn't yet played with their gel-like formula. The two shades I was sent are both pretty Spring/Summer shades, and also on the sheer side. Let's check them out.